Each one of us in our mundane everyday lives have sometime or the other faced problems that has disturbed our equilibrium for a very long time. Till the time we achieved our equilibrium we were faced ripples of problem exactly like a pebble in a pond, going back and forth. What is Problem? How do we identify what as problem? Problem is like a question raised that needs a solution or a situation that has to be resolved to bring back and set equilibrium in place. This could be physical, emotional, material or non material in nature. But a state of peace and quietness in that region gets disturbed is definite for all of us. So as we face problem we should ideally be looking towards a solution or an answer. For this our mind races back to identify a similarity in the pattern of problems from past. As far as we go back into our past we'd all find impressions of innumerable things small big, valuable non valuable just many many things. These impressions are neither permanent nor temporary but are kept inside our mind by the value to etch to them. Per say for someone who is very emotional by nature would have impressions of feelings and emotions up in the queue as it has been most used and thought over by him/her where as for someone who is aggressive in nature will have impressions of self defense actions on top. Like a fish escapes a fisherman while a snake puts his hood up. Simple but equivalent ways of using impressions at times of distress. Basically all I am trying to put up is a sense of queue of memories we all line up every day from our past to solve our problems. Queue of impressions is not just filled with important past details or memories but also filled with scenes from future. Future Perfect as imagery of our future considering everything from present will stay in equilibrium till future scene is achieved. That which gets toughest challenge when faced problem. 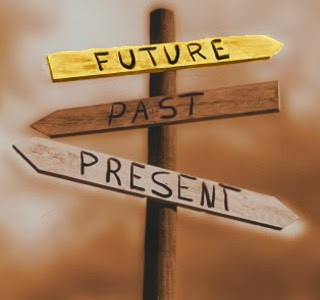 So everyone is using past experiences in present to keep future perfect. However that is not the only thing that happens inside us. I wish it was that easy then machines would have definitely gone ahead of us. When faced with a problem it is mostly practical but most often we get clouded with either past experiences or shattering of future perfect scenes and lose the judgment for present. For example you lose something important related to work in the morning. How a machine would have analyzed? Solution/Possible course of action - Figure out where last kept. Most probable places where it can be found. This would have been perfect course of action except a human adds a specialty of his own to this. He uses his queue of impressions. Past: He gets images from past what happened when a colleague of his lost a similar thing. What would happen to him if he cannot find it out? He might even create an image of what will happen to his job, to his family if the job gets lost. It leads to creation of fear, anxiety, sadness which in turn increases/decreases vital signs of our body and diminishes our chances of finding out that object further. These are mutated feelings that reverberate for a long time. Even if after few seconds you do find the object the feelings and notions that you created in your mind during that duration are now stored to be repeated sooner or later in case of distress. What we fail to understand is that "Queue of impressions" inside us are actually chosen and created by us every day. Slightly unaware slightly aware we indulge in an action we agree within is right. Let's say a child cheats one time and he justifies that internally for that moment pledging not to repeat that, the next time he gets an opportunity to repeat that he'd use that impression unknowingly and create a justification to break his promise. Over the time his justification grows stronger and his immunity towards his ethics grows weaker. Every time you see, feel, hear, touch and taste something it passes through this "Queue of impressions" to form an opinion in your mind. Considering its importance it lines up higher or lower in the Queue. These everyday choosing lands up where we stand when faced with problems. You cannot just wait for one day for a problem to come and choose your ideal way to face it. It happens every day and every second. Psychologically speaking each of us is a kind of personality in itself and thus approach towards problem for each one of us is different. And different books and authors have already explained innumerous number of ways our difference which though I quiet agree but also disagree. I disagree that each one us is using any different process inside for processing come from any background, any religion or any color. The notion that they think this way because their community, race or religion or whatever has anything to do with it is wrong. I agree that each one is different because each one every individual chooses to use his machinery differently. Some use past failures as excuses to run away , some may use the same as stepping stone basically the choice is different. The intensity of choosing the right words and thoughts which flourish as ACTIONS is different. Each individual is not a puzzle rather each puzzle is a piece in itself. In terms of Individual who maintains a sane mind at times of troubles and eludes from images of Past present or Future Perfect easily treads away from problems. It is for that "The Bhagwat Gita" talks of detaching from Fruit of action, which did not just mean detaching in action from hands but detaching in means from thoughts. Detachment from fear and anxiety over past and future increases efficiency many folds, if not for always it must be practiced at times of trouble. In terms of society where collective consciousness is very important it is essential to understand what Priority is for a Society. A society that wants to grow holistically has to work on all endeavors together. Compromising on any one will compromise on happiness of every other aspect. If you compromise on equality you cannot hold baton of security, if you compromise on truth you cannot pursue fraternity and so on. None neither an individual nor a society can survive in absence of a stable mind that is free from clutches of past and future. Problems are and will come it is the continuous training process and work on the Queue that will turn them to either a Challenge to overcome Or Stress to be endured. I also agree with you that the basic internal process is independent of the time, place, or culture any given human finds themselves in. Conditioning after the fact does indeed occur, and there is a certain amount of "feedback loop" effect between the micro- and macrocosms of "individual" and "society", but this manifests in the realm of value reinforcement/rejection, and not in the machinery of the evaluative process itself. The point you raise concerning the Gita is very apt, for some misinterpret the lesson to be solely the importance of duty, or the powerlessness of the individual in the face of greater events... but indeed each of us are internally making choices every minute of every day, and to pine away for a golden past which in actuality has never existed, or to paralyze ourselves in fear of what the future may or may not contain- both demonstrate extreme attachment, result in inaction, and make a corpse of the present. Often have I considered the example of two siblings, both born to a life of hardship, pain and suffering- yet one becomes very successful and compassionate, a pillar of strength determined to shine light into the dark places, while the other rots from the inside out, the center of a growing pool of anger and despair that increases the misery of all nearby. It is the choices we make from moment to moment that defines who we are as individuals and as a society; only by understanding the true essence of desire, detachment, and compassion can one "see only the eye of the bird", and increase harmony between the internal and external, choice and action, being and doing. I agree to your feedback loop point. It indeed is loop and that is why it gets very essential to stay detached as soon as problem crops up else once the loop sets in it gets very very difficult to stop it. One emotion leads to another and with every emotion lot of scenes attached to it in the queue pops up. That is Gita asks us to chose action than chose the fruit since fruit is future while action is present and aptly said the choice of those two siblings at times of despair becomes the only reason for each having a diferent fate. Most essentially just like bad emotions came in a loop good actions also come in a loop once you start choosing the right acts with sane mind it becomes a habit mind senses the peace it gets with this action and then repeats it next when required. I have simply fallen in love with the line which says “Justification grows stronger and immunity towards ethics grow weaker”. How true! I think this is the bane of the present age. Each day has something to teach us. Our choices make us better or bitter. Thanks Shreya for these wonderful thought provoking articles. You are helping me grow! Thank you Nirmala, i grow with these thoughts as well. Thank you for Dropping by @Aliasgarmukhtiar. Problem-solving is a mental process that involves discovering, analyzing and solving problems. The ultimate goal of problem-solving is to overcome obstacles and find a solution that best resolves the issue. @Krishnan sharma ..... Yes sir and that depends on how well what information we have feeded on the "Queue of impression" and it pops up according to the importance we give it. That is why each of our problem solving method is different from other. Thank you Sir for giving your time to my post. Looking out to read more of your posts at SpeakingTree.